East London has been our favorite part of the city since we first discovered it thanks to one of our extremely cool friends. One of the greatest aspects of living so close to London is discovering and trying new things–something East London is all about. That being said, this guide is definitely not exhaustive as new places are opening all the time. But it’s a good place to start if you are looking for some ideas about how to spend a couple days in the coolest part of London. Columbia Road Flower Market | Only open on Sundays, this market is an amazing resource for plants and cut flowers. Even if I don’t plan on bringing anything home, it’s still fun to look. And all along the street where the market is held are little independent shops you can stop by if you want to get out of the shuffle of the market. The Geffrye Museum | This is a free museum about domestic life in England that is almost never crowded and a nice place to escape the busy streets for a bit. I love visiting at Christmas, when each room is set up to reflect a different time period of holiday decor. But it’s also lovely in autumn when all the vines growing outside have changed color. Brick Lane Market | One of our absolute favorite things to do in East London is vintage shopping on Brick Lane. Some of the vendors are overpriced, but the stuff is curated well and you can get some good deals. If vintage isn’t your thing, there’s also loads of food and a craft market around the corner. Old Spitalfields Market | A close second to Brick Lane, everyday is a different market at Spitalfields. Check out their website (linked above) to see what they have going on! Street Art Walking Tour | We’ve never been on an actual tour of the street art in Shoreditch, but I linked one above because I’ve heard really good things! Either way, it’s fun to walk around with an observant eye, looking out for all the art this area has to offer. Junkyard Golf | An excellent night out mini golfing on Brick Lane. It’s not too expensive and super fun with a group. There are multiple bars inside and even a bar halfway through each course. Before I go into this list, I should say that on most of our trips into East London, we don’t sit down for a meal at all. We usually just grab food from one of the vendors on Brick Lane or Spitalfields. Lyle’s | British modern food in a light industrial space. For all our time spent in East London, this was probably the best meal we ever had. Quite expensive for dinner, so we opted for lunch instead and it was totally worth it. The Culpeper | I can’t speak for the pub on the ground floor, but the first floor restaurant and rooftop are both amazing. It’s nearly impossible to get a table on the roof, but if you’re already dining in the restaurant ask them to let you know when something becomes available and you’ll be first in line. The bedrooms upstairs also seem beautiful and well priced–such a good location to base yourself! Albion | A cafe and cute grocery perfectly situated for a coffee stop when exploring Shoreditch. Dishoom | A must visit on any trip to London for some seriously good Indian food. If you want to eat here for dinner, my best tip is to book a table at their latest lunch slot–5:45–otherwise you’ll end up standing in line. Not the worst thing in the world when they are handing out free chai lattes, but still. Best thing on the menu is the black dal! Soft Serve Society | Not only does this tiny ice cream shop have some quirky soft serve flavors like charcoal coconut, they also do freakshakes. If you’ve never heard of a freakshake before, check them out here! Beigel Bake | Salt beef bagel. Do it. It’s kind of an East London tradition. Lily Vanilli Bakery | The most beautiful selection of cakes and baked goods. And a good place to escape the insanity of the Columbia Road Flower Market. It is relatively quiet even though it’s always busy and you’ll probably have to wait for a table. Fabrique Bakery | This is my absolute favorite bakery in London. Could be because I am a sucker for Scandinavian buns, but regardless, it’s delicious. In my opinion, the cardamom buns are best. Also it’s across the street from the Geffrye Museum, so it’s the perfect place to stop for a snack after. The best part about East London is that it’s constantly changing and growing. It feels different every time you visit and I think that’s what kept us coming back so often. Well, that and the amazing food. My only advice is to have cash on hand because most places won’t accept cards and always check the hours if there is somewhere in particular you want to go. 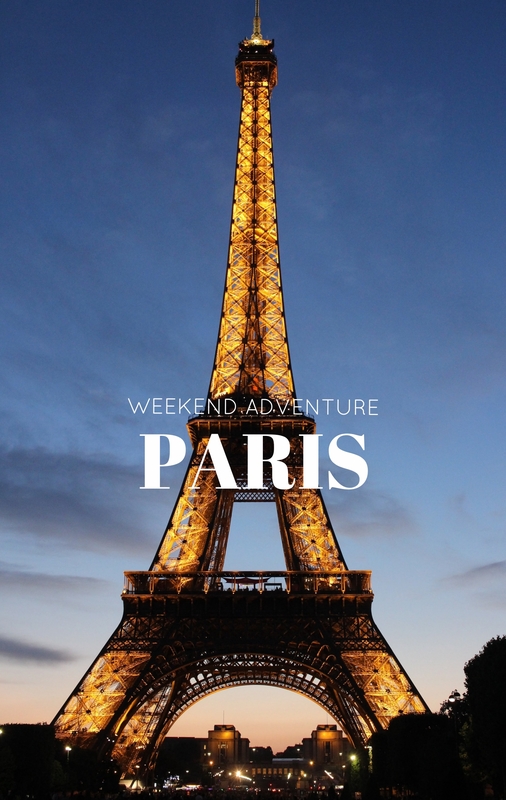 Crazy story: my friend actually won us this trip to Paris through an instagram contest. My flight and hers were both paid for and we were given a voucher for a one night hotel stay. It didn’t cover the entire trip, but it definitely helped. We decided George should come too and made a weekend of it. I was super excited for the opportunity to see Paris in a more relaxed light, rather than rushing around to see tourist attractions. Read on to see how we spent our weekend! Hotel Bienvenue | We loved our stay at this hotel, even if it started out a bit rocky because of our super late check-in. All the rooms are lovely and the entire hotel has kind of a Wes Anderson vibe. I like the pink rooms best, but the view from our room on the top floor was also pretty cool. This company has a couple other well priced hotels too, like Hotel Panache and Hotel Paradis, so definitely check them out for some other options. BOL Porridge Bar | While I might not normally choose porridge for breakfast while on holiday, this little place was really nice and within walking distance of our hotel. Porridge bars have become more of a trendy thing across Europe so I’m glad we finally gave one a try. Absolutely recommend! After breakfast, we set out for the city center–just taking photos and enjoying the amazing architecture of Paris. We had no agenda and were in no rush, so it was a thoroughly relaxed day overall. Palais Royal | This 17th century palace and gardens made for a lovely place to explore on a brisk January morning and is where many an instagram photo is taken. The art installations are quite nice too. Louvre | A more obvious touristy stop, but as much as I love the Louvre, we didn’t pay to go in this time. We just walked over because we were nearby and hung out in the courtyard. Jardin des Tuileries | Another classic French garden. On a sunny day, this is the perfect place to sit and people watch with some coffee or hot chocolate. Angelina | Speaking of hot chocolate, Angelina’s is the best in Paris and their original Rue de Rivoli location is right outside the Tuileries gardens. We were in need of an energy boost after walking all morning, so we got some takeaway cups to bring out to the garden. One cup is more than enough to share between two people–it’s very rich! CARBÓN | We made lunch reservations at CARBÓN knowing that we wanted to spend our afternoon in Le Marais or the Jewish quarter. The food and atmosphere were both amazing, so I was very happy with our choice. It is quite nice and fairly expensive though, just for the record. We like to eat well on holiday, but I think we make up for it by not paying to see many tourist attractions. After a good long break for lunch, we did a bit of shopping in the medieval alleys of Le Marais and I (mostly) put the camera away because it is a crazy busy maze of streets. But I’ll tell you some of the places we visited if you’re interested. Hippy Market | This was such a cool vintage shop with really good prices! My friend bought a couple faux fur coats while George and I just had fun rummaging around. Merci | Just down the road from CARBÓN, this concept store is fun to browse and almost like visiting an art gallery. It can be pretty expensive, but it’s still worth a look. Boot Café | Not sure why this is called Cordonnerie, but it is a cute spot for coffee. I wouldn’t plan on getting a seat though–it is pretty much always busy. We ended the evening with some of the district’s famous falafel from Mi-Va-Mi that we had been looking forward to all afternoon. I can’t say which is the best falafel as this was my first time in the Jewish quarter, but Mi-Va-Mi would be pretty tough to beat! On Sunday, we only had half a day to spend in the city as our flight back to London was pretty early in the afternoon. We decided to spend the morning in Montmartre and took an Uber from our hotel to save time. I used to think the Paris metro was great, but we had so many issues when we first arrived that we eventually gave up. Uber is pretty cheap in Paris anyway, as long as it’s not peak hours. Sacré-Cœur | While it’s free to enter the basilica, we were dissuaded by the massive line to get in. Still, at the highest point in the city, the view from the top is beautiful! We had the uber drop us off right outside, so we wouldn’t have to walk uphill. La Maison Rose | We really only stopped here for the photos. The café was closed anyway, though it looks really charming inside. I’m sure it would be a great place to come for tea and cakes! Le Consulat | After walking around the art market at Place du Tertre, we made our way back to this iconic café for a quick lunch and some coffee before our flight. It wasn’t the greatest food ever, but the service was surprisingly good considering Paris is known for their rude waiters. Plus, we couldn’t come to Paris and not sit outside a café in these traditional bistro chairs! I feel so thankful to have experienced a more relaxed side of Paris and would happily go again if it meant sitting in cafés, drinking wine and/or coffee while people watching. As long as I don’t have to wait in line to climb the Eiffel Tower, I’m all in. For our last official trip in England, we wanted to get all our friends together in a really great place and have a big party to say goodbye to everyone. We decided on a Landmark Trust property in the Cotswolds as it was close enough that people could stop by for the day, or make a weekend of it and stay with us. West Banqueting House | This pair of banqueting houses and almonry are all that remain of the Old Campden House built in 1613. We chose to stay in the west house as it is still set up for holding banquets and had room to accommodate a couple more people in the almonry. Jacobean banquet houses would have been used to host a dessert and wine course after a large meal, so that is exactly what we had planned for our weekend stay here. We kept the fire going almost the entire weekend, because if I’m being totally honest, it was super cold inside. It is probably fine most of the time, but we were here on one of the coldest weekends of the year and really the only time snow stuck to the ground all winter. The worst part was the drafty door in the bedroom upstairs, but it is such a beautiful room otherwise and the master bath is really grand and luxurious feeling. The little almonry next door was the perfect size for two with a double bed and bath up the spiral stairs and cute seating area on the ground floor. Saturday morning we all had fun exploring the snow-covered town of Chipping Campden. We stopped into a few shops and saw a couple of historic landmarks around town. Almshouses | This row of houses opposite our Landmark cottage were built in 1612 by the same man who commissioned the Old Campden House, Sir Baptist Hicks, to provide homes for the poor. Today, they are still private residences and are much unchanged aside from the addition of modern kitchens and bathrooms. Market Hall | An iconic Cotswolds market hall, built in 1627 out of the traditional honey colored stone seen all over the region. Today, some outdoor markets are still held under partial cover of the hall. Bantam Tea Rooms | Truthfully, we only chose this tea room because we had been walking around town all morning and the big fireplace looked very appealing from the window. Good cup of tea, but none of us got any food other than scones. Daylesford Farm | This place is amazing and I really wish I had known about it sooner. It has an incredible farm shop complete with cheese room and bakery, a light and airy café style restaurant–it even has self-catering cottages available for hire complete with spa services. If you live in the UK or have plans to visit the Cotswolds, it is a must-stop. For our weekend adventure, Daylesford was the perfect group outing on a snowy day. We shopped, we ate a delicious organic lunch, and we picked up some necessities for our cheese and wine banquet later that evening. Sadly, I didn’t get any group shots of our lovely meal together (having too good a time enjoying the night I guess). But this was the set up before everyone arrived! We spent the rest of the night just drinking wine and enjoying our last evening all together. It was the perfect send off and end to our time in the UK. We both miss it more than you can imagine! For our last official trip while living abroad, George and I knew we wanted to go somewhere special. I had been saving a trip to the Faroe Islands for May or June, not only to see the islands in the summer, but also to see the puffins. However, our moving date turned out to be early in April, so we just decided to go for it on our way out of the country. For those of you that don’t know, the Faroe Islands are in the middle of the North Atlantic between Iceland, Norway, and Scotland. So I wasn’t exactly expecting it to be a summery green landscape, but I also never expected to see so much snow–knowing the islands have pretty mild weather overall. Anyway, I’m so glad we got to see the landscape covered in snow, even if it did force us to cut some things from our itinerary. Below is a guide of how we spent our time on the islands. But they are really quite small and easily navigated, so you could always switch up activities without any lost time. The sun was already quite low in the sky when we arrived in Vágar, but somehow I convinced George to brave the icy roads in our tiny ill-equipped rental car for one quick adventure. Of course we went with the cheapest option possible. Linked below, it was the easiest rental experience ever. They email you the car info and where to find it in the airport lot so when you arrive, you just walk outside to find your car with the keys in it, ready to go! And off we went to one of the most incredible sights I’ve ever seen: Múlafossur and the tiny village of Gásadalur. Previously only reachable by a long and strenuous hike over the mountain, I for one am so pleased there is now a tunnel and vehicle access to the village. Fifteen minutes drive to the waterfall from the airport makes it such an easy and quick stop, we managed to make it there just as the sun was setting. Our initial plan was actually to wake up early and hike to the Drangarnir sea arch, but unfortunately, the weather made that impossible. We didn’t come prepared for snow and had to adjust our plans quite a bit. Instead, we had a leisurely morning near the harbor and went into town to stock up on supplies for the week. We drove to Bøur to get a view of the arch, but didn’t stay long. A bit later in the afternoon, some of the snow had melted and we decided to try a different hike in the area. Sørvágsvatn is a lake situated near some spectacular sea cliffs creating an amazing optical illusion. My photos really don’t do this landscape justice as I was way too afraid to get any closer to the edge. The ground was still quite frosty from the snow and I couldn’t bring myself to test it. But if you’re interested in looking it up, there are some outstanding photos of this place from other, braver photographers than I. Park near the boathouses on Vatnavegur to begin the walk. Others have said the walk takes only half an hour, but it took us nearly an hour to reach the cliffs only stopping for a few photos. This price really can’t be beat, so it’s worth staying two nights. Not luxury at all, but the options were quite limited anyway. We woke up the next day to a raging snowstorm, which I was quite excited about but did pose a problem for driving. We set out anyway, having checked the route beforehand and not seeing anything too alarming. There are a number of small villages I was hoping to see, but we settled on only two: Saksun with its hidden beach and cute grass roofed houses and Gjógv with its charming harbor and gorge. Both were lovely, although I would love to see them in summer with a few more people around. We stopped at Fossá (the highest waterfall on the islands) along the way, but didn’t manage to get the drone out far enough to see the upper falls. You can scramble up the grass in order to see it without a drone, but again we didn’t have the proper footwear for climbing in snow. My favorite stop of the day, however, was completely unplanned. On our way to Gjógv, we came across this view of a windy road leading down the valley to a village and I just loved it. Perhaps because it was unexpected. Now I’m happy to share that the name of the village is Funningur. That night we stayed in Tórshavn (the capital city) and ate our only nice meal of the trip. Read more about Tórshavn in our city guide, here. The next morning, we woke up to the most beautiful snow falling softly on the city and had to get out to see some of the sights. Again, check out more specific ideas for Tórshavn in this post. We checked out of our hotel fairly early and started driving to our next destination: Klaksvík. We planned on taking the ferry from there to the island of Kalsoy, but it didn’t seem worth it with all the trails covered in snow. Instead, we walked around the surprisingly cute Klaksvík, stopped into a few shops and cafes and just had a really laid back day. It was perfect timing when an instagram friend and Faroese local, @byolafsdottir, invited us to her house for coffee and snacks. This culture of hospitality actually has a name in Faroese called ‘heimablídni‘ and it’s an experience worth taking part in. Check out Harriet’s home and meals offered here. I only wish I had thought to look ahead and book a full meal with her! After leaving Harriet’s, we found ourselves with just enough time for one more adventure before sunset. And after talking with her, we decided on the Faroe Islands most northern town, Viðareiði. We hadn’t planned on visiting simply because it was quite far from where we were staying, but I’m so glad our plans changed because it ended up being my favorite. I couldn’t get over the way the sun was setting over the sea and mountains. This airbnb is by far the best place we stayed on the islands, perhaps because it was the only place we stayed that actually put thought into the decor. Not to mention the amazing view of the town and heated floors! On our way back to the airport in Vágar, we made a few stops just for fun. One to find these cool geodesic igloos that, for whatever reason, have been abandoned. And two, back at Múlafossur and Gásadalur, because why not? One of the main reasons George and I wanted to take this trip before leaving the UK is because it’s seriously half the price of getting there from the US. So unfortunately, I don’t see us going back any time soon even though it was incredible and I would love to. Both George and I really miss the ease of low cost travel within and around Europe. So if anyone is reading this from the UK, take advantage of where you live and the access you have to amazing places like this! Tórshavn far exceeded my expectations for the capital city of such a small country: the Faroe Islands. We had kind of a crazy time because we got to see everything covered in snow…in April. But we loved it! It’s a great place to base yourself from when exploring the islands and definitely worth spending a day or two wandering. Tinganes | The capital’s government buildings and one of the oldest parliamentary meeting places in the world. We loved the fact that this area is completely open to visitors, not to mention how cute it is. Tórshavn Harbor | Reminded me a little of Nyhavn in Copenhagen, only smaller. The cutest, most colorful row of buildings is lined with restaurants and cafes with outdoor seating along the water. Hotel Havn | There are a number of reasons why I chose this hotel for our night in Tórshavn, even though it isn’t that great. It was relatively inexpensive, within walking distance of everything in the old town, and pickings were pretty slim for hotels fitting both those criteria. Also, the restaurant on the ground floor, Frumbiti, is actually really nice and conveniently where breakfast is located. Paname Café | Definitely the cutest coffee shop in Tórshavn and a great little spot for a midday snack. Barbara | Pretty much every guide to Tórshavn will tell you to eat at Barbara’s Fish House. Housed in one of the oldest, most charming buildings in town, the atmosphere alone is reason enough to visit, but it helps that the food is amazing too. We went for the ceviche, horse mussels, and of course couldn’t resist getting the whole fried ocean perch. Ræst | This was our second choice for dinner in the city, although we didn’t actually make it there on this trip. Like Barbara, Ræst offers extremely traditional Faroese food–everything on the menu is fermented! We ended up trying a platter of traditional fermented food at a different restaurant and they were mainly just hard to swallow. But I read that somehow the chefs at Ræst make it all very tasty. Smyrjibreyðsbúðin | Being in a country associated with Denmark had us both craving smørrebrød (open face sandwiches) so we were very happy to stumble upon this place. I wouldn’t recommend eating in, but it was perfect for a quick, reasonably priced lunch. Excellent smørrebrød. Mikkeler | After having such a good experience with this Danish microbrewery in Copenhagen, we were excited to see they had a location in old town Tórshavn. It is such a relaxed place to spend an evening, for locals and tourists alike. Crazy story: the bartender we met was from Michigan! As usual in any Scandinavian city, the shopping was great in the Faroese capital. Crazy expensive, but fun to look. Below are the places we actually considered buying things. Føroya Heimavirkisfelag | A good place to look for traditional Faroese sweaters, if you’re interested. Also picked up a sheep horn here, which we thought was pretty cool. Öström | A design shop selling Faroese made art, homewares, and clothing. The perfect place to pick up gifts and souvenirs. Leirlist | Home of ceramicist, Guðrið Poulsen’s label: Leirlist. You can also find her work at Öström, but I loved checking out her studio and tiny shop at 16 Sjúrðargøta. ByOlafsdottir | Shamelesss plug for the friend we made in the Faroes, photographer Harriet Olafsdottir (@byolafsdottir). We met through instagram and she invited us over for lunch after seeing we were visiting her home town. I have always loved her photos, especially those of her flower-crown adorned pet sheep, Bambi. You can find her prints in a few different shops all over the islands, but I’m not sure exactly which ones. Anyway, the link above is to her etsy shop! One rainy weekend in October, George and I decided we were sick of staying in gross hostels whenever we visit Wales and thought we would try something nice for a change. Enter: the Quarryman’s Cottage. By far the nicest place I’ve stayed in Wales and probably some of the best accommodation even offered in the country. Quarryman’s Cottage | We drove west into Wales on a Friday night with plans to stay until Sunday evening (although the minimum booking is three nights). And we arrived with just enough time to get the fire going and relax for a bit before heading to bed. Get $40 off your first booking through airbnb by clicking here! In the morning light, we were able to fully explore the rest of the cottage. It’s only one bedroom (and I completely forgot to take a photo upstairs), but it is the perfect size for two. The slate floors were so amazing I wanted to somehow rip them up and bring them home with me. And the kitchen was lovely and light thanks to a skylight over the sink. Not to mention this sweet view from the back garden, below. It’s uphill from the house! After an easy Saturday morning and breakfast by the fire, we set off to explore the rest of the village. Cwm Penmachno village is the site of an old slate quarry in a sleepy part of North Wales. There is an interesting area to explore not far from the cottage where you can see the abandoned mine. On google, it’s called Penmachno Mine. We spent some time there, in awe of what was once there and wondering what happened to leave it in its current state. But before long, we were heading back to our car and talking about where we should go next. Tŷ Mawr Wybrnant | Neither of us really wanted to go far, so we settled on a national trust site close by, tŷ mawr meaning big house in Welsh. It is the former home of Bishop William Morgan who first translated the Bible into Welsh, thereby standardizing the Welsh language and helping to keep Wales’ national dialect alive. It was fascinating just listening to the host speak about the building’s history and turned out to be our favorite stop of the trip. Dolbadarn Castle | With Snowdonia Park serving as the most picturesque backdrop for this castle, I’m surprised it took me so long to find out about it. Regardless, I’m so glad we made time on this visit to see it. It is within walking distance of all the car parks for the mountain train, making it super easy to squeeze in. Tu-Hwnt-I’r Bont | More about the picturesque spot than the tea room itself to be honest. Regardless, it’s a fun stop and a good place to try some Welsh Classics like bara brith or rarebit. If you time your visit well in the autumn, those leaves covering the stone (in the photo above) become a vibrant red. We arrived a bit too late for that in early October and all but a few leaves had gone brown. Cwmni Cacen Gri | The absolute best place in Snowdonia to try Welshcakes and probably the best Welshcakes in Wales. Get them fresh off the griddle for the best experience. Climb Snowdon, duh. George walked up the mountain whereas I opted to take the train and we planned on meeting at the top. In the end, he decided to run up and beat me by a fair amount of time! Snowdon Mountain Railway | I actually loved taking the train up Snowdon, but I also had a number of issues. Firstly, it’s way too expensive, especially when a window seat cannot be guaranteed–you kind of have to fight your way into the line to make sure you have first pick of your section. And second, there is no way to walk up and take the train down. Single tickets up are available, but not down. A return ticket only allows 30 minutes at the top, which doesn’t leave any time for exploring and you must go back on the same train…or else you have to walk down the mountain. But if you’re short on time or otherwise unable to make it up the mountain, it was a pretty cool option. Pyg Track | Of the routes I know for climbing Snowdon, this is my favorite. The main, “easy” path that most people take is just too boring for me. At Pen Y Pass, you start in the mountains and have views almost the entire way up. And unless you go in winter, there is nothing difficult about this path. But if you plan on going in the summer, you must arrive early as the carpark fills up by 8 or 9 am. Of course, you can also arrange for a bus or taxi to drop you off at the trailhead. All the info for the walk can be found in the link above. Not sure if I would feel worse after climbing all that way for no view or paying to take the train. Either way, we tried to make the most of it. I do love foggy days afterall and these are some of my favorite photos I’ve ever taken. The feeling they evoke for me, takes me right back to that cottage in the mountains, snuggled in front of the fire. On Sunday night, when we arrived back at our cottage from our journey up Snowdon, both of us decided we might as well spend one more night. It meant waking up at 4 am for me to drive George back to work in the morning, but it was totally worth it for one more night relaxing in front of that fire. I probably went on this trip at least two years ago, but I still think it’s one of the easiest weekend trips to take from London. Not to mention, a crazy beautiful place worth traveling to from anywhere in the world. The Calanques de Cassis are just outside the charming town of Cassis along the Côte d’Azur in France. In French, the name means something like: the creeks, but they are basically just a series of inlets with some of the clearest, bluest water I’ve ever seen. Flights into Marseille from London are crazy cheap. I think I paid £9 for my Easyjet flight home. Granted, I had just come from Italy, so it was only a one-way ticket. Still, Marseille is not the most desirable destination, which keeps flight costs low. When you arrive in Marseille, the easiest way to get to Cassis is just to take the train. It takes about 15 minutes and costs a little over €6. A bus will then take you to the town center, or you can walk (it’s all downhill). Read this guide for clear instructions and photos about taking the train. After checking into our airbnb, my friend and I promptly started talking to our host about the walk to the Calanques. She basically mapped the whole thing out for us and told us approximately how long it would take. It was really helpful, but unfortunately I was still struggling with foot pain at the time and her estimates were definitely based on someone in good physical health. So just to let you know, this is a very difficult walk and not fun to do in the heat of the day. I recommend leaving as early as possible and bringing lots of water! Google maps will tell you the walk to Calanque d’En Vau from Cassis center is only 3 miles each way. In actuality, my friend and I tracked our walk at around 8 miles in total. I’m not sure if we veered from the path somewhere along the way, but I would say be prepared for an 8 mile roundtrip hike. We left early the next morning and had the trail almost to ourselves! The first calanque you come to will be the one pictured above with all the boats, Calanque de Port-Miou. This was a very easy walk from the town and the beautiful blue water will make you excited for the rest of the walk. If you have a car, you can park at Port-Miou and save yourself half an hour of walking time. After another 30 minutes, you’ll arrive at Calanque de Port Pin, the smallest of the three inlets. We decided to keep walking past this cove in order to make it to the end while it was still relatively early. As we continued, the scenery wasn’t all that exciting except for a few interesting spots. There was a section further on that required a bit of a scramble downhill and I knew would be terrible on the way back up. By this time, I was questioning the expedition altogether. It was crazy hot and unlike the walking I was used to in England where it’s always cloudy and about 50 degrees. But after another hour of walking, we rounded a corner to this view and I decided it was worth it. You really can’t see anything, until you arrive at the beach! Can you believe the color of that water? We went up to check out the water and quickly realized we wouldn’t be spending too much time in there. It was freezing! But that was fine by me, because all I wanted was to find a shady spot to put my feet up. Having now completed the trail to the water’s edge, I can say that I would almost rather have done the hike to the viewpoint above the Calanques as I find the pictures more interesting from that vantage point. However, the trail was closed during our time there. In fact, even the trail we took is closed during the summer months due to the risk of wildfires. The best time to visit is either June or October when the trails are open. Alternatively, if you want to see the Calanques from the water, you can take a boat tour or even kayak there any time of year when the water’s calm. But the tours don’t allow you to get off on the beach which is a bummer. That evening when we got back to our hostel and for the entirety of the next day, I felt absolutely terrible. I attempted to go for a short walk around town in the morning and managed to take a few photos before I had to lie down again. I was so disappointed and felt really bad for my friend traveling with me. I know that she quite enjoyed her time in town, but still, it was awful for me. I’ve never been so sick while traveling. Anyway, my point is that the town is ridiculously cute and worth at least a day or two of exploring and/or lounging in the sun. Once again, this was a rather last minute trip and my friend and I were too late in booking our accommodation. We stayed in a hostel through airbnb that was absolutely fine and right in the center of town. The hosts were lovely and very helpful, as were all the people we met staying there. But it is still a hostel and therefore, not my fave place to be on holiday. So I’m sorry I don’t have any food or lodging recommendations, but as it’s such a cute town, I know you’ll have no trouble finding some tasty food. And if you’re ever in doubt, just ask a local! I know I would love to come back and explore this place properly. With it being the first of June and summer nearly upon us, I thought it might be an apt time to share a little midsummer inspiration courtesy of last year’s gathering in Cornwall. I love celebrating the changing of seasons, even if it means just putting on a dress and decorating a store-bought cake with fresh strawberries! The little cabin we stayed in was the perfect backdrop for our midsummer festivities and can be rented through airbnb here. But if you’ve never used airbnb, use this link for $40 off your first stay! In case you aren’t up on your Scandinavian culture, Midsummer is something Swedes celebrate on the longest day of the year, June 22 (or whatever Saturday is closest). This usually involves a smorgasbord, flower crowns, and the all important strawberry cake! Of course, as we were celebrating with British friends, ours had to include a cheeseboard and elderflower cordial. I also thought I would share the recipes we used for our smørrebrød (open face sandwiches). This was the easiest recipe I could think of to celebrate Scandinavian culture. Let me know in the comments if you end up trying them! Just stir everything together and taste until you get the proportions you prefer. Top the sunflower bread with a scoop of shrimp and garnish with roe and dill sprig. There are so many different ways to make this recipe. We simply used what we had on hand, but you could definitely use substitutions like greek yogurt or regular sourdough bread. Spread crème fraîche on the bread and place 2 sliced potatoes on top. Spoon more crème fraîche on potatoes before topping with fried onions and chives. Sprinkle with salt if you want. PS. If you want to make your own knækbrød, this is the recipe I use and it is great. The only thing I always add is a sprinkle of coarse salt or Maldon before putting them in the oven. We couldn’t leave Cornwall without stopping by one of its famed picturesque fishing villages, so on the way home we stopped by both Charlestown near St. Austell and Polperro. I’ll be honest, the only reason we stopped to see Charlestown is because I love Poldark and it’s one of their filming locations (for more of Poldark’s Cornwall locations, check out the BBC’s list). Regardless, it was a fun place to take a walk along the harbour and break up our drive a little. Polperro, on the other hand, is a place I could have spent much more time. It was a bit of a trek to get to as there’s no parking in the village, but definitely worth the walk. Even on a busy Sunday in the summer, it felt quiet and quaint. We ate dinner that evening at a pub with a rooftop patio and it was the perfect way to end our trip. Are you ready to learn about my favorite island in the UK? It’s called the Isle of Harris and Lewis because it’s technically two islands in one. The larger and more populated Lewis is well known among history lovers because of its abundance of ancient sites like the Callanish Standing Stones and Dun Carloway Broch. The Isle of Harris, on the other hand, is better known for its more rugged landscape and white sand beaches. Both islands combined make for the perfect trip as far as I’m concerned: a little education, a little adventure. We only spent 3 nights on the island which was just barely enough time to see it all. But it took so long to get there, we lost a lot of time to the journey. Luckily, it’s a beautiful ride no matter how you choose to go. I’ll tell you about our route as we were conscious of both cost and time. First, we flew up to Aberdeen in order to meet our friends living there (it would have been faster to fly into Inverness, but wasn’t too far out of the way). We spent one night with them before picking up a rental car and heading out to catch the ferry from Ullapool. I recommend booking in advance, here. From there, it felt like a scenic 2+ hour cruise all the way to Stornoway, Lewis’ largest town. Alternatively, you can fly straight into Stornoway via Loganair, however, flights from London are neither cheap nor direct. Then on Lewis, rental car options are limited and costly. But if you’re more concerned with time, this is definitely the way to go! Accommodation is so sparse on Harris and Lewis. We went with glamping pods or wigwams to save money, but also because there was nothing else available. Perhaps if you book far enough in advance, some of the guesthouses may be available. Sandy Bay Wigwams | For the most part, we enjoyed our wigwam stay–especially the fire-pit and amazing view. The only thing I didn’t like was being nickel and dimed for things like firewood and marshmallows after the fact. Regardless, it was a cool place to stay. Callanish Camping | These camping pods were a bit more rustic than the wigwams and lacking in running water, but they were still awesome. The lady who runs them was so friendly and helpful when we arrived and their proximity to the Callanish Standing Stones is unbeatable. Ok, so we didn’t actually get to eat at most of these places. In Scotland, nothing is open on bank holidays or weekends…and those are basically the only times we travel. Anyway, I thought I would share them in case you get the chance to go. Visit Outer Hebrides website and their Eat Drink Hebrides Trail was a great resource for finding these! Croft 36 | This cute honesty farm stand is located right near the wigwams we stayed in on Harris. I think we tried to go on a Friday and it was closed, so maybe it would be best to call ahead. According to their website (linked above), they now do meal delivery with pre-booking as well! The Scallop Shack | Again, really not sure what their hours are, but I was able to find photos on google with their phone number listed. Of course, we didn’t have service at all on the island, so I probably should have made that call on the mainland. I would have loved some fresh Hebridean scallops. The Stornoway Smokehouse | Slow cured smoked salmon from the last traditional smokehouse in the Hebrides. I don’t think you’re able to view the kiln and smokehouse (although I would have LOVED that), but you can visit their small shop and pick up something tasty to take away. Charles Macleod | Home of the Stornoway black pudding, aka the best black pudding in the world. I normally won’t even eat black pudding (because I think it’s gross), but I make an exception for this one. Isle of Harris Distillery | I can’t tell if I love this gin because it’s good or because the packaging is so beautiful. Either way, this distillery is definitely worth a stop on Harris. Edge O’ the World Alehouse | The Hebridean Brewing Company is the only craft brewery in the Outer Hebrides and has won tons of awards for their beer since their start in 2001. Our favorite was the Berserker, made from a 150 year old recipe (and also everyone else’s favorite). They were so friendly and let us sample as many as we wanted! Wish we could have picked some up to bring back with us, but they were sold out. After stocking up on food and supplies for the weekend, we made our way south to the Isle of Harris first because the weather forecast looked better for spending some time on the beach. I try to plan these things according to the weather and sometimes it works out better than others, but regardless, it was SO beautiful. Seilebost | Just to get you in the right direction, this is where you should start looking for beaches on Harris. But seriously, take your pick of beautiful sandy beaches and you can have one all to yourself. We particularly enjoyed climbing up to the MacLeod Stone for a cool view out to Taransay at sunset. Luskentyre Beach | Probably our favorite beach on Harris. The clearest water and purest sand, there was so much to explore here. Unfortunately, on the day we chose to visit, it was too cloudy to see any of the mountains in the distance. So I can only imagine how amazing it would be on a sunny day. St. Clements Church | Medieval church founded by Alasdair MacLeod, the 8th clan chief of the MacLeods, who died in 1547. We nearly had the entire place to ourselves making it such an atmospheric experience to wander around the church and graveyard. But if you happen to make it down to the water, there is also the cutest stone harbor. After being on the more mountainous Harris, it can feel a bit anti-climactic driving north to the Isle of Lewis. But even though it appears flat and boring, there is so much to see if you know where to look! Lewis has a mixed Norse and Celtic heritage evident not only in place names but also abundant archaeological sites. Bostadh Iron Age House | Although I had seen pictures of this place before arriving on the island, I didn’t know how to get there until we came across a guide book inside our wigwam. It’s technically a rebuilt Pictish house on the site where a well-preserved settlement was found (the original houses were found further down the beach, near the water). But there are also the remains of a Viking farm as well as blackhouses from more recent times. It would be so hard to choose a favorite spot on this island, but I loved the feeling of this place! If you want to go inside, make sure you check the opening times. Dun Carloway Broch |One of the oldest structures on the island and one of the best preserved Brochs in Britain–pretty impressive considering the number of ancient sites on the island. Gearrannan Blackhouse Village | Can you believe you can actually stay in these? They even have a hostel option if you’re looking to save money. Again, they seem to book up early, so plan ahead! We had fun just walking around the village, but you have to pay even to do that. Norse Mill & Kiln | We came across this completely by accident, just driving by! It’s a reconstructed site, but still super interesting to see. Stac a’ Phris Arch | My favorite sea arch to date! I actually added the google maps location of the arch myself, so you could say it’s not well known. Some people walk over from the parking at Dail Beag Beach, but that was a longer walk than we were hoping for. We just parked along a road nearer the arch and walked about a mile out. Doesn’t it look like the best?! I would recommend going in summer to make the most of the beaches, but there isn’t too big a difference in the winter weather anyway. It’s pretty magical no matter when you choose to visit.